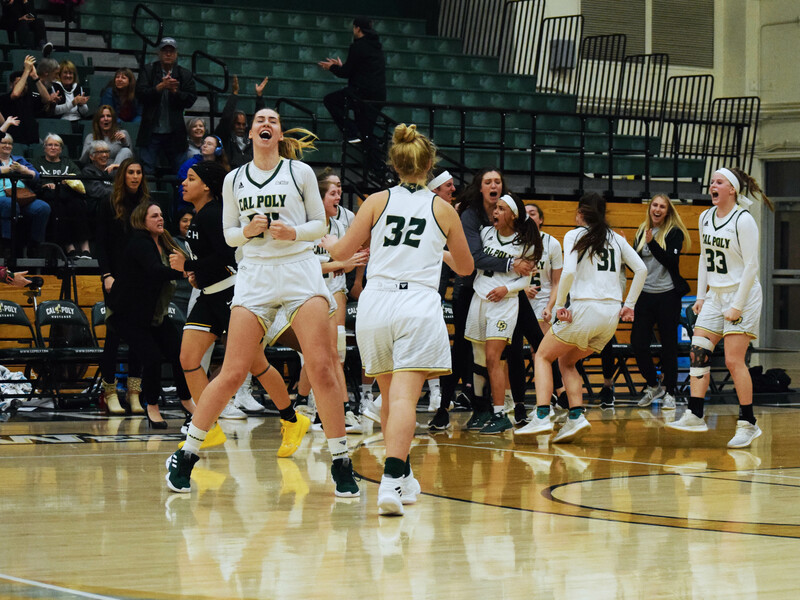 The Cal Poly Women’s Basketball team broke its five-game losing streak with a 66-59 overtime win over Long Beach State, securing their second Big West Conference win. The Mustangs (5-14, 2-6 Big West) recovered from recording their worst start in conference play in program history. Senior point guard Dye Stahley flipped a switch for the Mustangs when she scored the three-pointer to tie the game and take the team into overtime. She recorded a career-high of 23 points and added nine rebounds and six assists. Stahley also hit the 302 career assists mark. Long Beach State (6-15, 3-5) opened the scoring in the opening minute of the game, but Stahley responded with a layup to put Cal Poly on the board. Junior forward Hana Vesela scored a jumper for the Mustangs’ first lead of 4-2. The lead changed seven more times in the first quarter, ending 12-10 for the 49ers. Early in the second quarter, Stahley retook the lead for the Mustangs with her first three-pointer of the match. Freshmen guard Maddie Willett sunk two back-to-back three-pointers to put Cal Poly in front 19-17. Long Beach State ultimately snagged the 29-26 lead going into halftime. The Mustangs drove the hoop right out of halftime, going on an 11-6 run with Vesela contributing a three-pointer and a jumper. Cal Poly gained the lead by the end of the third period thanks to Willett’s third three-pointer bat 2:40, 37-35. Cal Poly’s defense held onto the lead by only allowing 8 points from the 49ers, ending the third quarter 40-37. The fourth quarter started off with an 11-2 run by Long Beach State. Senior Katie Nunnelley had the only points for the Mustangs with a rebounded layup at 6:32. It seemed like the 49ers might run away with the game, with their largest lead at 50-44 with only 1:28 left in regulation. Stahley cut it down to just a two-point lead with two back-to-back free throws at 1:15 and two more with 47 seconds remaining, bringing the score to 50-48. Long Beach State snatched another layup and a free throw to re-establish Cal Poly’s four-point deficit with 27 seconds left on the clock. Vesela quickly came back sinking a three-pointer with 19 seconds left, the Mustangs trailed 53-51. The Mustangs gave up a defensive foul on the next possession. The 49ers made their first free throw, which brought their lead to 54-51. Stahley drained a three pointer from the top of the arc to tie up the game with 11 seconds remaining, sending the game to overtime. Long Beach State kicked off overtime with a jumper at 4:35 and sunk a free throw at 4:05. But Stahley wasted no time, putting up a three-pointer at 3:46 to tie it back up at 57-57. The 49ers returned with a layup, and Stahley responded with her fourth three-pointer of the night, sliding ahead 60-59 at 1:24. Cal Poly’s defense was dialed in, holding Long Beach State at 59 for the last minute. Nunnelley and Stahley each landed two free throws in the final 16 seconds, leading the Mustangs to the 66-59 win. “We have just been working and working, coming into practice an hour early, getting shots in, getting the reps that we need, and I think today showed that if we keep doing what we’ve been doing in the past then we’ll be good,” Stahley said. Stahley shot six for 13 from the field, went four for six three-point range and landed seven of her eight free throw attempts. “I just try to come in and do whatever I can and set my teammates and kudos to them for hitting their shots because without them hitting their shots then there’s no way I’m getting 300 assists,” Stahley said. The Mustangs are looking to carry this momentum into their next game against UC Davis (15-6, 7-1) on Saturday, Feb. 9th at 2 p.m. inside Mott Athletics Center.